TheRustedChain - The Blog: Lucky! You may know that I do giveaways here on my blog once in a while. But sometimes, I'm even lucky enough to win them on other's blogs as well! Recently, I won some pretty paper goods from ArtSnark. And a stunning brooch from Bonzie. Seriously. Have you seen her work? Jaw dropping gorgeous. And now I have a little something to give to you! Well, one of you anyway. SouthernTraditionsBoutique would like to give you your choice of reusable sandwich or snack bags. No more buying plastic baggies! 1. Check out Torri's shop. 2. Leave a comment here telling if you'd rather have a sandwich or snack style bag. Contest ends Saturday, July 18. I have been eyeing some different ones of Etsy with kiddo heading to Pre-K in the fall. I prefer the snack bag size. I like peanut butter & peach jelly sandwichs, chips, Little Debbie dessert and Diet Dr. Pepper in my sack lunch. a love note from mommy...everyday! How fun! I like the snack bag. Right now, I have been packing fat free turkey hot dogs for my lunch! Sounds so random, but it works perfectly! I place the hotdog in some saran wrap and then I seperately wrap a whole wheat bun in some saran wrap. When it's time for lunch, I zap the hotdog in the microwave for about 25 seconds and then eat up! It's pretty good! Cute! I like the snack bag. Our lunches consist of leftovers and a yogurt. Not too exciting, but it's usually good and offers a variety. I like to make burritos, individually wrap them, and place them in the freezer for days when we don't have leftovers. I like the sandwich style bags best. My favorite thing to pack is chicken salad with sprouts and brown mustard on either a pita or a croissant. i like the snack bag best. my favorite thing to pack in the lunchbox is a secret love note!! i'm browsing etsy now for my first love notes of the upcoming school year! My favorite thing to pack is dessert! I'd love to have a sandwich bag - and thank you. I think both are a great idea. I like the sandwich bag as that's the usually the main entree if I ever pack a lunch. In my son's lunch I usually pack a sandwich, drink, granola bar and yogurt. I hadn't heard of these either. (Yes, they are cute!) I would probably put the snack bag to use more. We all like a variety for our snacks. I thrown something new together all the time...something sweet with crunch and of course a little chocolaty too! Hmmm I think I would have to say I like the sandwich bag, it can hold like double the number of snacks :) My favorite lunches to pack are leftovers. My husband and I are big fans of leftovers and think most stuff is best the second time around. Plus it saves one the trouble of having to think about bringing for lunch! pamperingbeki = sunshine for mah day. I like the snack sized bags. Packing my lunch is a major issue for me. I usually buy Lean Cuisine's and then end up going out to lunch instead! Maybe if I had a cute bag, I'd be likely to pack and eat my lunch at work! Ohh I like the Snack bags. These ARE cute! I can use them to take to work. And my favorite thing to pack for lunch are crunchy peanut butter and grape jelly sandwiches. MMM!!! Very fun! I like the snack bags the best. And my favorite thing to pack in a lunch...something homemade. Chocolate Chip Cookies, homemade granola bars. Yumm! Thanks for doing another giveaway! I like the sandwich size bag! My favorite thing to pack in lunches is a love note from Mom! I am such a dork. 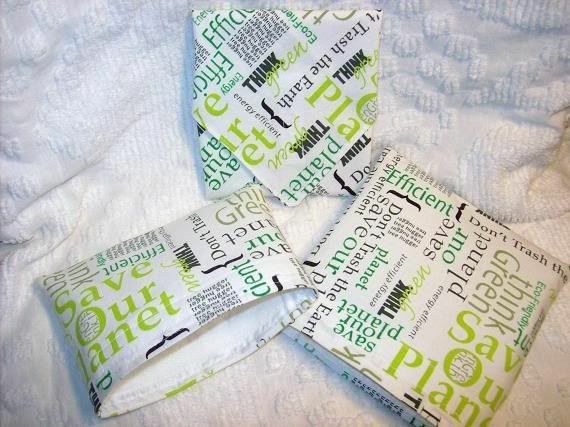 I love these and we do recycled bags when shopping. I've ben eyeing these for awhile. Great idea. I would like the sandwich bag to pack the all time favorite of peanut butter and jelly. Cute! I think I like the sandwich bag... 'cause it can always work as a snack bag too. I don't pack many lunches... hubby makes his own, and I homeschool so that means most lunch is eaten at home. But, when I do, pb&j is always good, or egg salad sandwich w/ sprouts. Of course, I have freak kids who refuse to eat pb&j...what is their problem? cute bags, a great idea! Congrats on your win! i love these! i really like the "green" theme written all over the green product! i've been all over some yummy pita chips & hummus lately. it's a tasty treat! i really like the sandwich size. Love the snack bag, Torri always is so creative with these things. My favorite thing to pack is a handful of almonds or peanuts in the shell so if I get hungry at a moment that doesn't have great timing I can snack to tide me over for a bit. Thanks for stopping by my blog. Am I too late to enter this cool giveaway? What a great Etsy shop. Love the reusable sandwich bags. What a great idea! Have a great weekend and Happy Anniversary! Love Tori's stuff...my daughters have taken lunch since pre-k and now my younger one is going to be a junior in high school and decided she didn't want to add to the garbage, so we started looking for alternatives to ziplock bags and came up with the cute Carebear and polka dot wraps and bags. Love them...great for all ages!